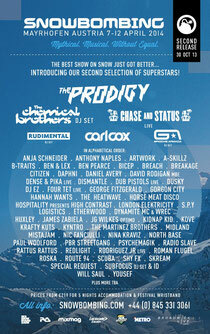 The Prodigy and The Chemical Brothers were recently confirmed to headline Snowbombing in 2014. Selling over 25 million records worldwide, The Prodigy will be tearing onto the Forest Stage to hopefully treat Snowbombers to a high octane, adrenaline-fueled performance. The Chemical Brothers said: "We’re very excited to play such a unique festival, and a new one for us. We have been working on new material for a while now, so every DJ show gives us a chance to share music with people… let's have a ball!" The Chemical Brothers have released eight studio albums (five of which went to Number 1), many singles and also have a film under their belts. Now in its 15th year, Snowbombing is taking place between 7th and 12th April 2014 in the snowy alpine town of Mayrhofen, Austria.With mountains as a perimeter fence and boasting some great festival venues, including a sky-high igloo 2,000 metres above sea level, enchanted forest clearings, cosy alpine lodges and medieval barns. Also making a welcome return to the mountains are Chase & Status. After recently releasing their forth studio album ‘Brand New Machine,’ the duo will be entertaining the crowds with an exquisite live set delivering their blend ofdubstep-infused breakbeat. Rudimental will return to the slopes for a second year, after the band went down a storm in the forest in 2013.